Our Linked Roller Blinds in Melbourne are the perfect solution for wide window spaces that cannot be covered adequately using a single blind. By linking the roller blinds together, using the Easy Link System, there is minimal gaps in the fabric between the joins. Not only do the linked blinds offer better light control over wide spaces, they are also simple to use. Two or more roller blinds can be connected, dependant on their overall size. The Easy Link System connects two male and female drive ends together simply, and securely. Adjustable cogs ensure that the blinds are able to line up perfectly. It’s best to talk to one of our friendly team to find your ideal solution. Our options include spring assisted and motorised operation systems. Spring assisted linked roller blinds are ideal for areas with a wider space, and long drop, as they will assist with the extra weight. Once the blinds are connected, they operate as a single blind, and will move up and down in unison. 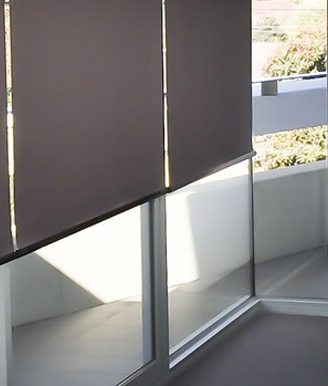 Great for windows and sliding doors, our child safe, linked roller blinds in Melbourne are a cost effective, ultra-simple solution for wider areas of the home or office.